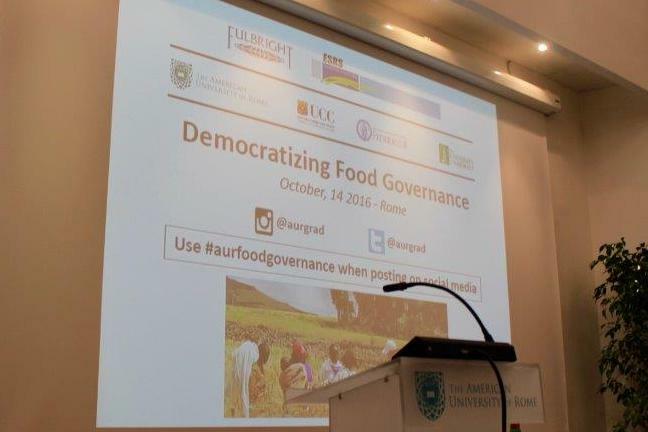 Junior fellows Eileen Bogweh Nchanji participated at the international conference "Democratizing Food Governance" in Rome, 14 October 2016. Nchanji, working on resource politics amongst vegetable farmers in Tamale, gave a presentation on "Politics in Food Governance, Tamale Northern Ghana", focussing on how individuals, organisations and institution involved in the food governance system behave in situations of governmental plurality and ambiguity. The conference brought together scholars to discuss the emergence of a new civic engagement in food systems all over the world. Food systems in developed and developing countries are dynamic due to the ever changing socio-political and economic environments in which they operate. Actors and institutions at the different nodes of the food system, in negotiating and networking with others actors and the environment are made subjects but also contribute to the processes of governance. This is especially true in cases where government ambiguity and plurality exist. These processes of governing are usually constructed around the different interests and agenda of the different actors and are often not democratic and sustainable. In a world where complex relations exist at a local and global level between many actors, there is a need for a collective decision, on how to eradicate poverty and food insecurity, especially in the city.